The RiverSoftAVG SVG Component Library (RSCL) is a scalable vector graphics (SVG) component library for Delphi XE2-XE5 and supports both VCL and FMX utilizing SVG capabilities. The RSCL provides an SVG viewer in both VCL and FMX that adheres to the SVG specification version 1.1, a modularized language for describing 2D vector and mixed vector /embedded raster graphics based on XML. 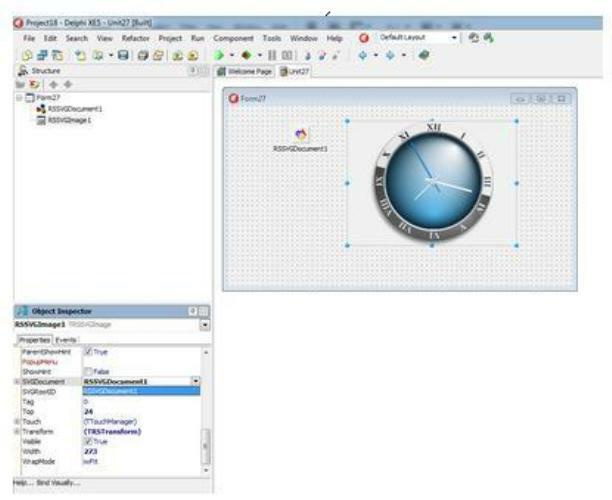 The RSCL provides Delphi developers access to the large library of free and commercial SVG designed for building interactive and optimized graphics for the web. The RSCL is, for the most part (see SVG v1.1 specification compatibility), a conforming static, that is, interactive SVG viewer (e.g., dynamics are provided through Delphi instead of through SVG scripting. RiverSoftAVG SVG Component Library enables you, the developer to use a component again and again, therefore making you as a Delphi developer more efficient and better able to compete in what is already a highly competitive graphics marketplace. It supports from the SVG format: Document Structure, Styling, Coordinate Systems, Transformations and Units, Paths, Basic Shapes, Text – Text and TRef, Gradients and Patterns, Fonts – Delphi Fonts, Painting: Filling, Stroking and Marker Symbols – Implemented except for Filters, Color – Implemented except for color-profile, and Clipping, Masking and Compositing – Implemented simple alpha composting (VCL and FMX) and Clipping (VCL Only). You can also convert SVG to design-time/run-time controls. It does not support from the SVG format: Gradient Fills are limited on Mobile (limitation of FMX), No Clipping support in FMX, No Masking support, No Filters support, No Animation support hence it must be implemented through Delphi, No Dynamic SVG support, that is, hyperlinking, scripting, since it is static. Head over and check out the RiverSoftAVG SVG component for yourself.